A total solar eclipse occurs when the Moon completely covers the Sun, as seen from Earth. Totality during such an eclipse can only be seen from a limited area, shaped like a narrow belt, usually about 160 km (100 mi) wide and 16,000 km (10,000 mi) long. Areas outside this track may be able to see a partial eclipse of the Sun. Looking at a solar eclipse without any protective eyewear can severely harm your eyes. The only way to safely watch a solar eclipse is to wear protective eclipse glasses or to project an image of the eclipsed Sun using a DIY Pinhole Projector. A partial solar eclipse happens when the Moon only partially covers the disk of the Sun. An annular solar eclipse occurs when the Moon appears smaller than the Sun as it passes centrally across the solar disk and a bright ring, or annulus, of sunlight remains visible during the eclipse. 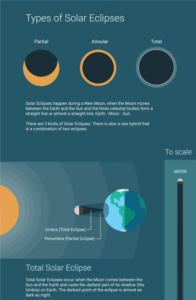 A hybrid solar eclipse is a rare form of solar eclipse, which changes from an annular to a total solar eclipse, and vice versa, along its path. The Moon does not have its own light. It shines because its surface reflects the Sun’s rays. A lunar eclipse occurs when Earth comes between the Sun and the Moon and blocks the Sun’s rays from directly reaching the Moon. Lunar eclipses only happen at Full Moon. 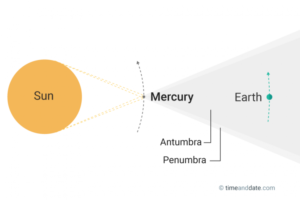 There are 3 kinds of lunar eclipses: total, partial, and penumbral. 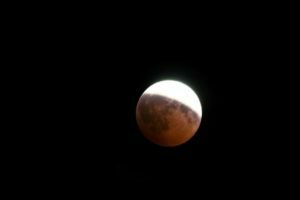 A total lunar eclipse occurs when Earth’s umbra – the central, dark part of its shadow – obscures all of the Moon’s surface. A partial lunar eclipse can be observed when only part of the Moon’s surface is obscured by Earth’s umbra. A penumbral lunar eclipse happens when the Moon travels through the faint penumbral portion of Earth’s shadow. When a planet comes between Earth and the Sun, it is called a transit. The only 2 planets that can be seen transiting the Sun from Earth are Venus and Mercury because they are the only planets which orbit inside Earth’s orbit. From 2000–2199, there will be 14 transits of Mercury. However, Venus transits are even rarer with only 2 this century, in 2004 and 2012.